Hard cover book by author Tom Davis. Book size is 7" X 7" with 96 pages. Why do dogs bury bones? Why do dogs turn circles before lying down? Why do dogs chase cars? Or their tails? 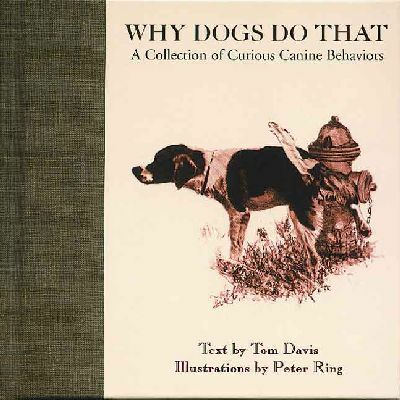 These and 36 other curious canine behaviors are informatively and lightheartedly answered in the handsomely illustrated Why Dogs Do That. An original pencil drawing, rich in detail, illustrates each insightful explanation of odd but characteristic dog actions, social graces and sometimes unseemly deportment.